It must be new colour time. Introducing the new GTV 300 i.e in Marrone Etna. GTV 300 i.e. 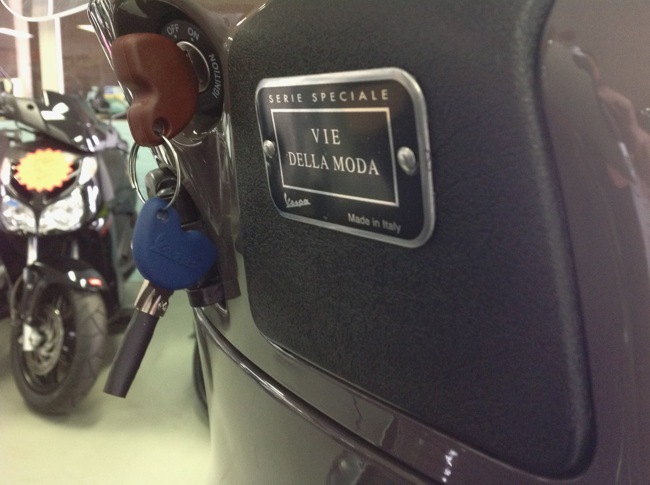 "Vie Della Moda"
Coming across this new GTV colour naturally had me pulling out the iPhone for a few pictures. New colours are always newsworthy and choosing a colour can sometimes be as important as choosing the scooter itself. Normally more so with brands such as Vespa. So this one did catch my eye. Introducing the GTV 300 i.e. "Vie Della Moda" in Marrone Etna. Same GTV 300 specifications, just an alternative colour choice. The GTV 300 i.e. "Vie Della Moda" is priced at $9490 + ORC. For a list of affiliated Scootersales.com.au dealers click here. 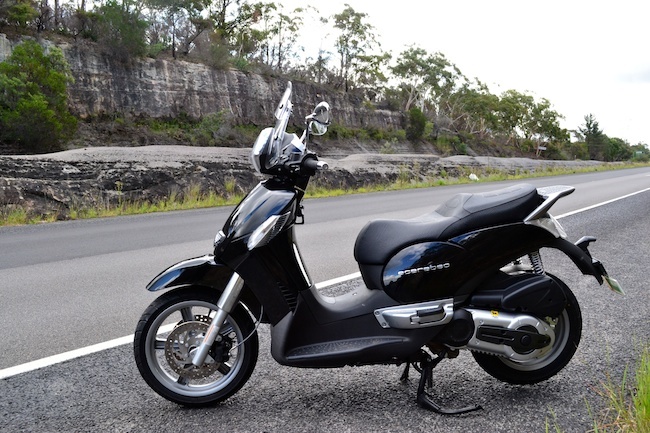 For further information see the Piaggio Australia website. Is this the future for scootering? Probably not, though here is a clear indication that BMW is serious about greening the future. For electric scooters it's been a hard gig. Electric scooters have always lacked range and serious performance when compared with petrol powered alternatives. The C evolution is a production ready scooter from BMW that has borrowed many of BMW's electric car initiatives. And with car backing it seems far more likely to succeed than others who have come and gone trying. BMW's C650 Sport and touring models are close to launch here in Australia. These petrol powered scooters will give BMW an extension into a new two-wheeled segment. The C evolution is confirmation that BMW is ready to add an electric alternative. 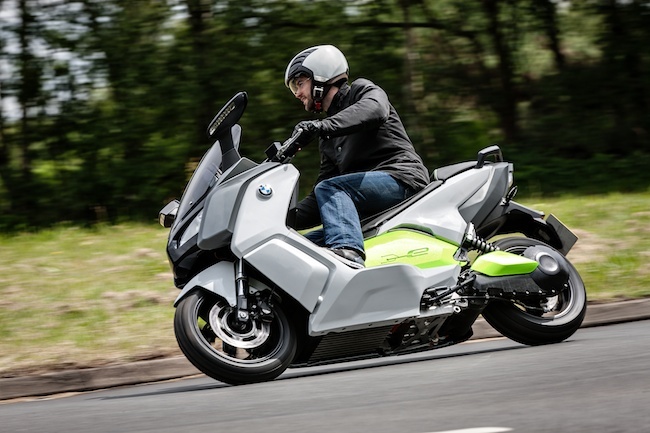 The BMW C evolution is no longer the "e-concept" and looks to be production ready. This C evolution will showcase BMW's talent. It will be as much about this, as it is about being green. In Europe and some parts of the USA, there is a continued push for green vehicles. Government assistance through cheap registration and tax concessions is one way governments are getting people to look at these green alternatives. Electric only areas are common across major capital capital cities in Europe. Here in Australia we are just starting to see a host of automotive product hit the market and this will no doubt drive the hype around electric alternatives here. As an inner city machine you can see the benefit. Though here in Australia we don't have the economic drivers in place to seriously consider electric as an alternative, not yet anyway. Actually we don't even have them in place for petrol powered scooters either, which already have a huge carbon footprint advantage over any car on the road. 1. Strategy, development stages and vehicle properties. There have been drastic changes in the requirements for individual mobility concepts, in particular for conurbations. More than ever before, individual mobility is defined today in terms of sustainability. Growing traffic volume, rising energy costs and constantly increasingly stringent CO2 restrictions on vehicles in inner cities - these are the challenges of the future. The BMW Group has recognised these challenges and is developing serial production solutions to meet the mobility needs of today and tomorrow. As an integral part of the BMW Group, BMW Motorrad is addressing issues of individual single-track mobility and future customer needs and is developing appropriate solutions in response. 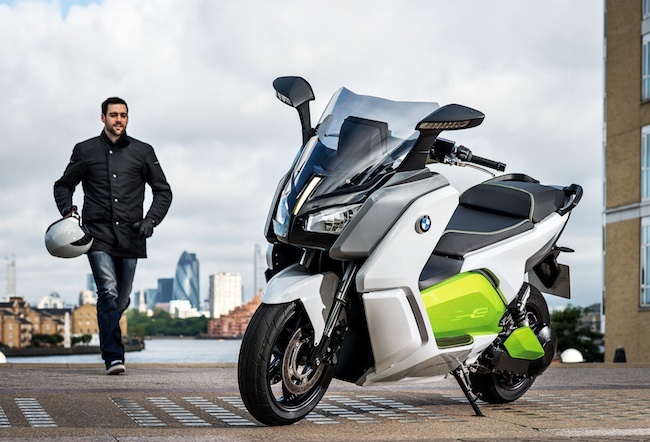 In this connection, BMW Motorrad has expanded its business activities with the addition of the facet "Urban Mobility", presenting two serial production vehicles in 2011 -the maxi scooters C 600 Sport and C 650 GT. 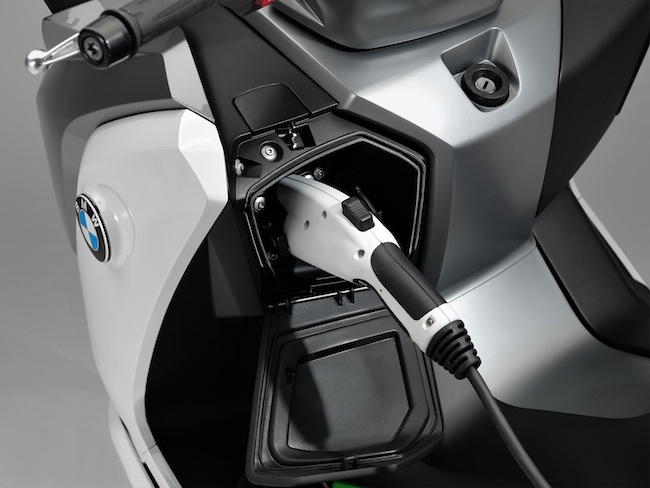 Following the BMW Group's sustainability strategy, BMW Motorrad aspires to consistently pursue electromobility at this early stage, especially in the urban environment. In a similar way to BMW i in the automotive division of the BMW Group, BMW Motorrad's accelerated development of single-track mobility likewise stands for visionary vehicle concepts and mobility services - as well as inspiring design and a new premium philosophy clearly defined by sustainability across the entire value creation chain. BMW Motorrad will thus be launching an appropriate premium product on the market in the foreseeable future. The concept vehicle E-Scooter was presented at the BMW Motorrad Innovation Day 2011 as the first development stage in this direction. Due to their limited performance and range, purely electrically powered scooters have been suitable almost solely for inner-city use with a restricted range of operation up to now. With its sustainable technological solutions, however, the concept vehicle BMW E-Scooter already shows a significantly extended range of operation. Shortly after this, the second development stage saw its premiere at the IAA in Frankfurt: the design study of an e-scooter made by BMW Motorrad - BMW Concept e. This embodies the aesthetic vision of an electrically powered scooter. BMW Motorrad presents the near-production prototype of an e-scooter as it might soon go on the market. Since it was conceived as a future-oriented vehicle for commuting between the urban periphery and the city centre, there were two particular requirements for its development: performance figures comparable to those of a maxi scooter with a combustion engine and a long range in realistic conditions of use. With its deployment of five fully ridable "C evolution" scooters, BMW Motorrad has extended its experience in the field of e-mobility with single-track vehicles and continues to expand its expertise in this segment. BMW Motorrad is also making use of a number of events in Europe to further raise the profile and promote acceptance of single-track electrically powered vehicles, thereby preparing the market for such a vehicle with a view to launching a serial production model. In this pilot phase, the vehicles are being operated in real conditions of use and within areas which reflect their intended environment. The aim here is also to explore the infrastructure, such as establishing a network of e-mobility providers which might include vehicle rental companies and car-sharing firms. 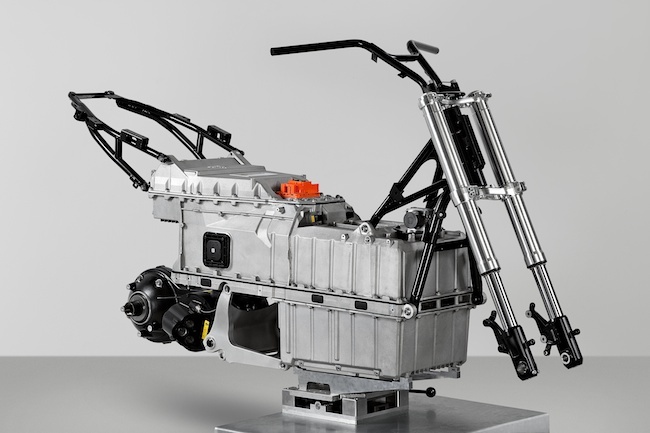 Innovative electric drive via drivetrain swing arm with liquid-cooled alternator, tooth belt and planetary gear. 11 kW continuous output (homologation according to ECE R85) and 35 kW peak output. High-voltage battery with high capacity (8 kWh) and innovative air cooling. Synergy effects with BMW automobiles and electrical safety to car standards. Multifunctional TFT instrument cluster and LED daytime running light. Innovative colour concept and design. Electro-performance at the level of a combustion engine. With 11 kW continuous output (homologation according to ECE R85 to determine motor outputs) and 35 kW peak output, the "C evolution" has a powerful motor and provides a high level of riding fun. The top speed is electronically limited to 120 km/h. The scooter supremely handles motorway riding and overtaking - even with a passenger. It is also capable of effortless hill starts on steep slopes with a pillion passenger. 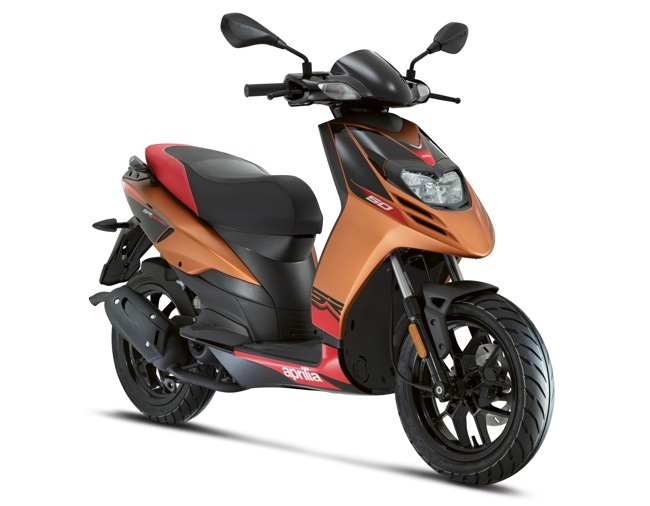 In terms of acceleration from 0 to 60 km/h, it comfortably holds its own against current maxi scooters a capacity of 600 cc or more. Compared to conventional combustion engines, the electric drive of the "C evolution" also offers significant advantages at low speeds in particular. Thanks to elaborate power electronics settings, the alternator offers the rider an instant, spontaneous response. There are no delays in torque build-up at all as are typical in combustion engines due to the clutch engaging and disengaging. High range of up to 100 kilometres due to large battery capacity. At 8 kWh, the storage capacity of the battery is extremely generous and ensures a range of up to 100 kilometres. This means that realistic zero-emissions riding in the big city and in urban environments is no problem at all. As in other areas, BMW Motorrad has been able to draw on synergy effects with BMW automobiles here. For example, the "C evolution" uses the same lithium-ion storage modules as are installed in the BMW i3. Here, developers paid particular attention to the quality and service life of the storage modules so as to ensure that the range is preserved even after many years of service life and in very cold weather. One of the main technological challenges was optimum cooling of the high-voltage battery. On the one hand it was necessary to avoid excessively low temperatures due to the fact that the interior resistance of the cells is heavily increased as a result, thereby reducing power. On the other hand, the temperatures must not be too high since this would impair the lifetime of the cells. While in electrically powered cars a cooling agent is normally used to cool the battery, air cooling is used in the "C evolution" in order to save space and weight. The heat of the high-voltage battery is dissipated by means of an aerodynamically optimised cooling air shaft at the centre of the battery casing through which there is a constant flow of air. To ensure optimum heat dissipation, the battery base has longitudinally arranged cooling ribs. However, the battery casing in die-cast aluminium not only holds the cells with their special architecture but also the entire electronics unit for monitoring the cells. It also acts as a load-bearing chassis element. The power electronics for the electric drive is installed behind the battery casing. This not only takes care of controlling the alternator within a range of 100 to 150 volts but also responds to rider commands, for example by detecting the position of the throttle grip. The system also processes information from the brake system and decides whether energy should be recuperated and how much recuperation torque is to be applied to the rear wheel if required. The "C evolution" is powered via a drivetrain swing arm. The alternator is positioned behind the battery casing and integrated in the swing arm. Due to the proximity of the alternator output shaft and the swing arm axle, the moment of inertia around the swing arm centre of rotation is minimised. This also provides optimum suspension/damper settings and a sensitive response. The secondary drive is via a tooth belt from the alternator to the rear belt pulley on the output shaft. From here, power is transferred to the rear wheel via a planetary gear. The total gear reduction is 1:8.4, while the maximum rotational speed of the alternator is 10,000 rpm. The alternator and power electronics are liquid-cooled. BMW Motorrad has conducted lengthy road tests to develop a form of recuperation which is unique in single-track vehicles and very transparent for the rider. The "C evolution" is ridden in exactly the same way as a scooter with combustion engine. The rider does not have to actively initiate energy recuperation since the vehicle does this automatically whenever possible. For example, energy recuperation commences when the throttle grip is closed and - as in a combustion engine - the generator function of the alternator creates drag torque which depends on the degree of recuperation. The drag torque generated by the alternator is like the familiar "engine brake" that takes effect when removing the accelerator with a combustion engine. Recuperation is also carried out during braking, converting kinetic energy to electrical energy so as to charge the battery. Here, a system of sensors is used to tap into the brake pressure on the front and rear wheel brake. When the power electronics detects that the rider is braking, the alternator builds up drag torque, thereby supporting the brake manoeuvre and recuperating energy. By regaining energy during coasting or braking, the range of the two-wheeler can be extended by 10 to 20 per cent, depending on riding style. Short charge times and charging technology based on the car model. The battery is charged via the integrated charging device, either at a regular household socket or a charging station. When the battery is completely flat, charging time ideally lasts less than three hours. The car-type charging socket - currently the only one of its kind in an electrically powered two-wheel vehicle - is located behind a cover in the footwell at front left. The charge cable required is housed in a storage compartment on the right-hand side of the footwell. It is fitted with a mains plug to fit the respective national system. The fact that the charge socket is the identical to the car standard has the advantage that the "C evolution" can be charged at charge stations throughout the USA with integrated charge cable and standardised plug, for example. This technology is not currently offered by any other electrically powered two-wheeler. Charge cables with the relevant specifications will be offered in later serial production models so that they can be charged at stations in Europe. As a company of the BMW Group, BMW Motorrad is one of the very few motorcycle manufacturers to be able to draw on in-house experience and expertise in the automobile field in the development of electrically powered vehicles. The synergies available here range from the use of the same technical components through to high-voltage technology and the associated safety requirements in terms of cables, plugs, battery electronics and safety shutdown. This also includes the insulation monitoring device, the high-voltage indicator, the high-voltage distributor and the DC-DC converter which serves to convert high voltage to low voltage so as to feed the 12-volt vehicle power system and the control units. High-voltage safety standards established by leading automobile manufacturers (> 60 volt direct current) and functional reliability have been applied to an electrically powered two-wheel vehicle for the first time here. 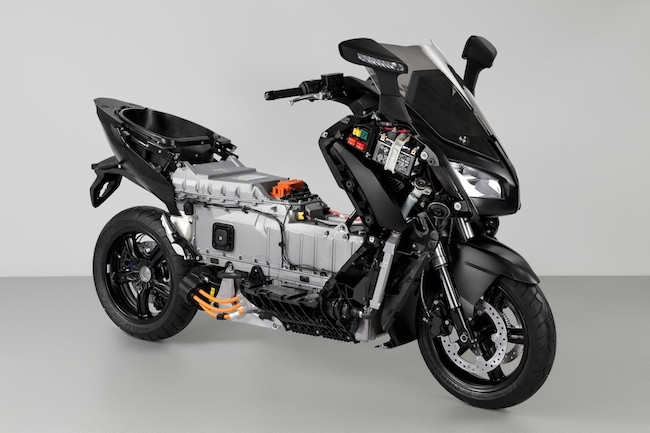 Development in accordance with ISO 26262 is currently unique among (electrically powered) two-wheel vehicles and ensures that all functionally relevant features are developed in accordance with standards and reflect the current state of science and technology. Unlike existing maxi scooters with combustion engine, the "C evolution" does not have a main frame in the usual sense. The aim of chassis development for the "C evolution" was to combine the best possible directional stability at high motorway speeds with agile handling in urban traffic. Engineers also set out to make full use of the advantages provided by an extremely low centre of gravity - due to the low position of the battery. For this reason, chassis design is based on a torsionally stiff hybrid composite structure made up of a load-bearing, torsionally rigid battery case made of cast light alloy with integrated mounting for the single-sided drivetrain swing arm. Bolted onto this are the steering head support and the rear frame in steel tubing. In urban traffic in particular, the riding experience is characterised by extremely light handling and excellent slow-running properties. The weight of the vehicle is at a level comparable to maxi scooters with a combustion engine. Wheel control as well as suspension and damping is taken care of at the front by an upside-down fork with a generous fixed fork tube diameter of 40 mm. The rear wheel suspension consists of a single-sided drivetrain swing arm. At the rear, suspension and damping are performed by a spring strut placed on the left-hand side, directly controlled and adjustable at the spring mount. The spring travel is 115 millimetres at front and rear, thereby offering a high degree of comfort. Lightweight tyres to reduce rolling resistance. At the front, the "C evolution" rolls on a 5-spoke light alloy die-cast wheel, size 3.5 x 15 inches, while the size of the rear wheel is 4.5 x 15 inches. In order to reduce rolling friction and thus make the most efficient use of the electrical energy stored, the "C evolution" has lightweight tyres. These are special Metzeler Feelgreen tyres with optimised rolling resistance in the sizes 120/70 R15 at front and 160/60 R15 at rear. The tyres were developed with two clear aims in mind: environmental compatibility and high efficiency based on minimising rolling resistance, at the same time providing a higher mileage. Rolling resistance was reduced by 25 per cent as compared to the Metzeler Feelfree tyres. At the same time, the Metzeler Feelgreen tyres are very light, with reduced hysteresis response and a new tread with specially created tread grooves for optimised rolling resistance. At the front, a twin disc brake system with 270-millimetre diameter and 2-piston floating calipers ensures powerful, safe deceleration. At the rear there is a single disc system also with a diameter of 270 millimetres and 2-piston floating caliper. In order to achieve a stable pressure point and optimum controllability, all brake lines are steel-wrapped. A high level of active safety is ensured by the BMW Motorrad ABS. Weighing just 700 grams and extremely small in size, the Bosch 9M dual channel ABS allows separate regulation of the two brake cycles for front and rear brakes. However, the ABS software has also been adapted so as to control the recuperation process in line with the specific requirements of the "C evolution". 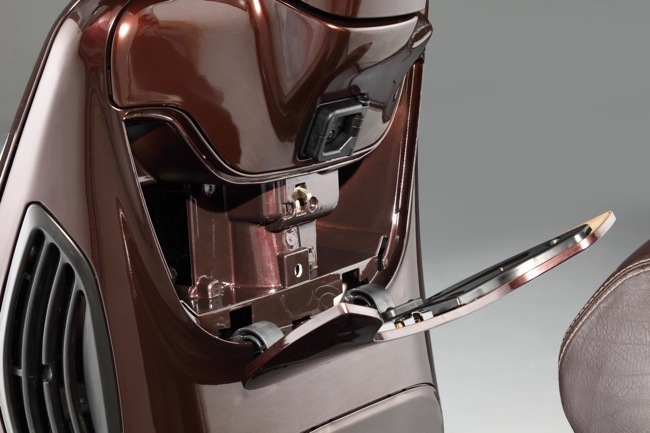 As in the BMW Motorrad maxi scooters C 600 Sport and C 650 GT, the hold brake is activated automatically when the side stand is folded out. The instrument panel of the "C evolution" has a large, easily legible TFT display which is conceptually based on that of the BMW i3. It has the obligatory speed display as well as offering a wealth of other information. This includes display of the battery charge state (SOC = State of Charge) and the energy balance. The latter is displayed by means of a progress bar, indicating to the rider whether energy is currently being converted into forward propulsion or being recuperated. This information helps the rider in his efforts to ride as efficiently as possible. In addition to the familiar indicators, the instrument cluster of the "C evolution" naturally features all the status displays required by law in electrically powered vehicles. This includes warning lamps to indicate a potential insulation error or power limitation in the event of overload (see ECE R 100). The front lighting unit encompasses headlamps with high and low beam. 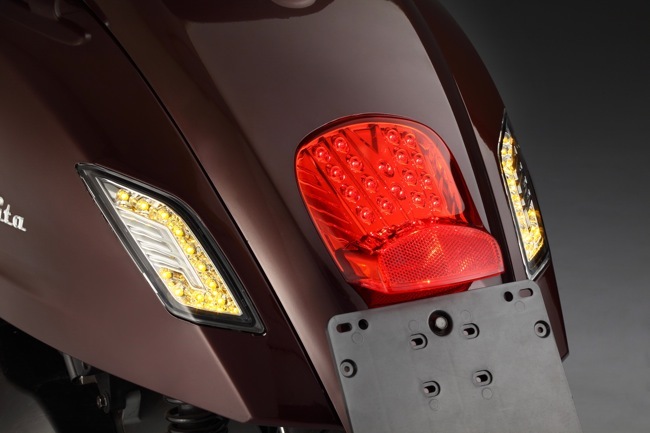 The "C evolution" also features a centrally located daytime running light. At the back there is a rear light in LED technology. The "C evolution" draws on the innovative styling of the BMW Motorrad family, offering a thrilling, inspiring design which arouses an emotional response to the new drive technology. As in other BMW motorcycles, the so-called split face runs across the upper trim section, giving the scooter a distinctive and dynamic front view. BMW Motorrad design style is also reflected in the styling of the twin-tipped spoiler in the front trim and in a boomerang-shaped, aerodynamically formed floating panel in the side trim. The short, sporty rear will have a helmet compartment in the serial production model and emphasises the proactive character of the "C evolution". The combined effect of the colour "Light white" and the highlight colour "Electric green" reflects the vehicle's specific properties, such as maximum environmental compatibility, supreme dynamic performance and simple handling. What is more, the illuminating "e" inscription on the two battery side trim elements and motor unit bear out the technical character of an electrically powered scooter. We get the latest updates direct from the 2012 Aprilia Motorcycle and Scooter launch. Aprilia/Moto Guzzi importer, John Sample Automotive, invited dealers and press from all over the country yesterday to announce model updates for 2012. This included Aprilia scooters, Aprilia Motorcycles and Moto Guzzi. Below we have all the scooter updates and a quick mention of the major motorcycle announcements. We've already seen, touched and ridden extensively the SR MAX 300. This model was given its official launch to dealers and national press yesterday. Will be priced at $6990 + ORC and available in two RSV4 replica colour schemes. One white the other being black/red. The first handful have already left the warehouse, the next shipment arrives shortly. If high speed commuting/touring is forming part of your decision process, place the SR MAX on the test ride list. Sportcity 300 or now the Street Cube 300. Announced yesterday, the Sportcity 300 will get two new additional colours entering the range towards the end of September. A new red colour scheme, along with a new matt black. This will replace the existing "Blackline" edition. The SR MT remains relatively the same machine as the Sportcity One it replaces. Choice of either a 50 cc 2-stroke and 125 cc 4-stroke engines. Black gloss 14 inch wheels look like they've been pulled from the superbike range, the gold calipers really standing out against the black rims. The SR MT retains the flat floor and the dash remains unchanged also. Pricing will remain on par with previous models. If you're into the sports look, Aprilia have given this model a real working over. The two models on display yesterday were gloss white and gloss black, both look fantastic. Will be available in black, white and orange colour schemes. 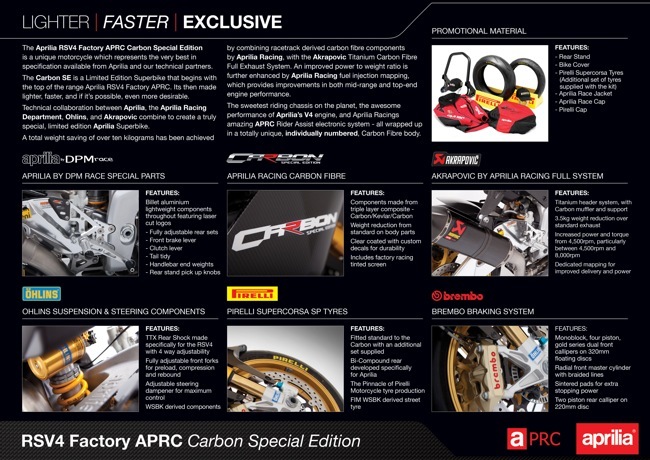 Aprilia RSV4 Carbon Special Edition. I'm not sure why I'm mentioning this one here but to me this is pure eye candy. For fans of Aprilia bikes this is one for you. 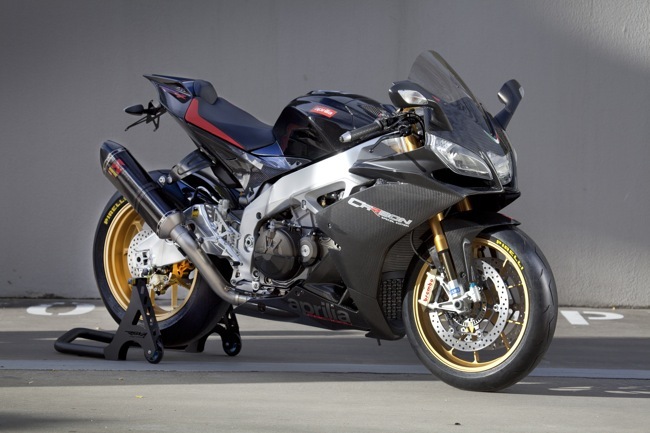 The Aprilia RSV4 Factory Carbon Special Edition was just breathtaking. 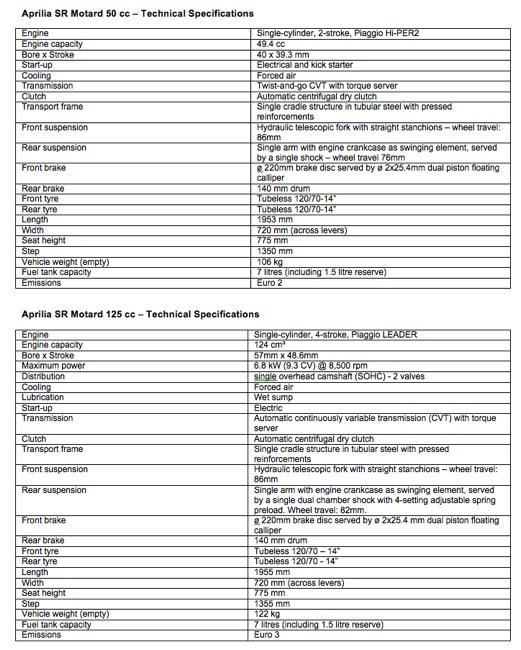 Full use of the Aprilia Racing catalogue, top-spec parts replacing existing components. The standard RSV4 Factory retails for around $30,000, the Special Edition Carbon will retail for just under $40,000. New V7 range announced. New V7 "Stone" with an introductory price of $800 under the outgoing model. Extensive updates across this range including major engine revisions. 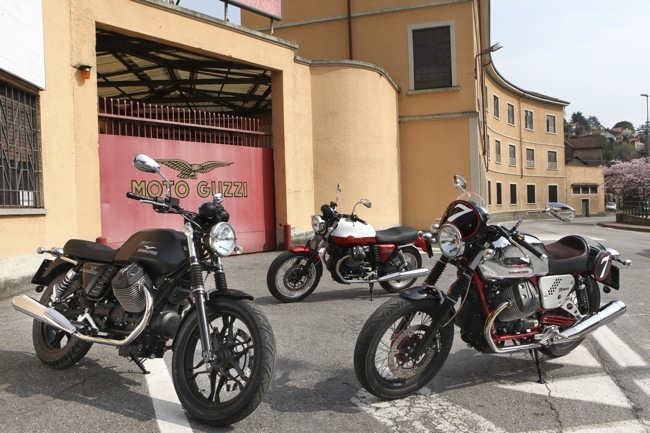 Mention of a V7 1200 joining the Moto Guzzi range in 2013. The mid-year point gives an excellent opportunity to see how the year is panning out, what is proving popular, and what isn’t. Interestingly the overall Australian sales figures look less than encouraging for scooters. A 13.5% drop compared to the first six months of 2011 doesn’t look great. However a more detailed analysis shows some interesting things. 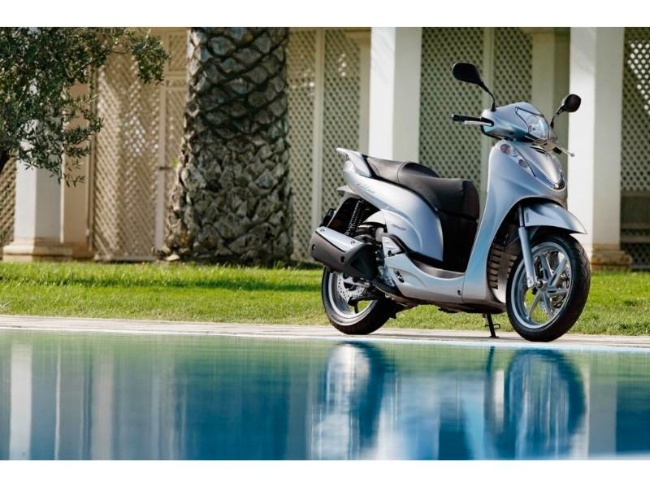 In terms of top sellers, Honda and Piaggio dominate the top 10 with no less than 7 scooters between them, with the list rounded off with three of the budget models from SYM, Daelim and WA importer MCI. No surprises there perhaps – the top 10 has always been dominated by well-priced and/or cheap offerings. But a quick look at the overall brands and there are some clear headlines from the bigger selling brands. Honda, Aprilia and Piaggio sales are up, revealing their strategy of providing good quality, well-styled, but competively-priced models works well. Vespa holding. Significant drops in Kymco and SYM sales, and previous big sellers Yamaha and Vmoto continuing their downward path. An apparent big increase for Daelim is almost entirely due to the rebadged Sachs Amici (now Daelim Besbi) accounting for almost two thirds of their overall sales, and similarly two thirds of MCI sales claimed by the Riviera, a model retailing for under $1500. On a personal basis however, it’s far from doom and gloom. Our own sales figures for the first half of the year have been our best to date, even outdoing those of the boom year of 2008. Our biggest prediction for the year was about how popular the new Typhoon 50 was going to be, and it hasn’t disappointed, already our top selling scooter of the year so far, despite long periods at the start of the year when we very quickly ran out of our initial stock! 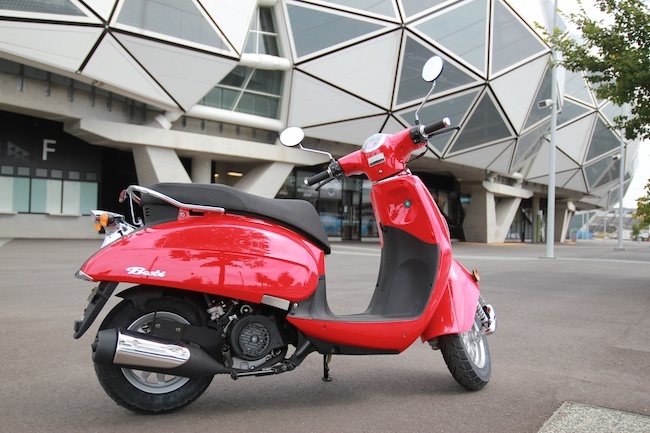 Its instant popularity didn’t just surprise us, it also initially caught Piaggio Australia on the hop at the start of the year, but we are now enjoying good stock levels so we can continue to satisfy the growing demand. It’s highly unusual for a new scooter to hit the ground running, but the combined pedigree of the “Vespa” 50cc engine in a sporty package makes it a very attractive proposition. The current Aussie top-seller, the Fly 150, took a couple of years to start hitting its boot-straps, but it’s now the “standard” for people who are looking for a good quality machine at a no-nonsense price. The Typhoon 50 already looks to be on track to do the same. My biggest satisfaction has been the return of the legend. The PX must now be regarded as the quintessential scooter. The first year of production was 1977, and whilst in the modern automatic age it doesn’t turn over the numbers that it did, sales are steady to the growing number of cognoscenti who want something a bit different, a bit interesting, and something that you can make very much your own. We’ve recently become a dealer for German scooter powerhouse, SIP, who are not only on-sellers for a huge variety of scooter parts, accessories, and performance gear for 50cc, geared and bigger auto scooters, they produce a number of their own products (and very nice they are too!). My PX now boasts an SIP front shock as well as new SIP tubeless rims (all made in Germany) improving the handling markedly, and the Malossi pipe has opened up the engine, and gives it the distinctive ring-a-ding ding which is noisy, but just so compelling. A new air filter and high flow fuel tap, with yet another upsizing of the main jet, are next week’s projects. And all of these parts cost about $500 including freight. Bargain. The various upgrades we are doing for our PX customers is helping keep the workshop busy, and giving us all a lot of fun and satisfaction too. If you haven’t ridden a PX yet, I’d encourage you to give it a go. You might begin to understand why all those geared scooter clubs are such purists! As I reported last month, the committee of the Motorcycle Division of the MTAA (Motor Traders Association Australia) got together this time in Adelaide for its 6-monthly meeting. Apart from the issues affecting the industry that we try to tackle, it’s also an opportunity to see what is happening with the other regions and brands. As far as scootering is concerned, at the last meeting I had raised the issue as to whether the MTAA should lobby to get the ADR for mopeds changed, such that the maximum speed be raised from 50kmh, to a more reasonable 70kmh. Most of us who ride know that keeping up with traffic is far safer than having car drivers constantly riding up ones backside! Of course the solution most current users employ is to remove the restrictors or modify the vehicle, which although helping resolve their safety concern, it leaves any party thereafter involved (whether the rider or the person who has done the modifications) exposed legally. However the discussion at this meeting led to the general consensus that raising the issue with the appropriate authorities was probably just opening a can of worms, and could ultimately result in more stringent regulations over licensing and use than we currently have. So outvoted, but at least tried. One big item of industry interest was the decision by some of the big Japanese bike suppliers about how their dealers could utilise some of the new portal sites (such as DiscountNewBikes.com.au), effectively banning them from showing prices for new bikes on these sites. This is an interesting development, as it shows that finally the suppliers are recognising, and trying to deal with the sometimes crazy pricing some dealers use to win market share, at the expense of the overall industry. I realise that many Australian retailers get little sympathy on pricing due to the habits of the greedy few who mark-up astronomically, but the bike industry, unlike the car one, isn’t full of dealers who can afford to run around in Porsches. Every vehicle purchase counts, and losing margin to undercut or price-match a dealer who either has no business sense, or has another profit stream, simply means that there is less money available to keep those businesses profitable. And when that happens, they go out of business. Up till recently, this hasn’t necessarily been an issue. Plenty of new dealers popping up all the time, but no longer. And finally some of those suppliers have realised that if when you lose a dealership, you lose sales – because the dealer network is effectively their sales network, and once broken its damned hard to repair. So trying to take back ownership of the RRP may be the first step in the process of revitalizing their networks, getting them focused on customer satisfaction and business profitability, rather than purely on number of sales a dealer makes. Rogue dealers who are only focused on themselves are not good for their competitors, but suppliers need to realise that they aren’t good for them as suppliers either – however giving up those short-term sales is not easy. However you just need to look at the continuing growth of Harley Davidson sales, to realise that hugely controlled brand understands what it’s doing, and knows how to keep its dealers! A final interesting story which has possible major ramifications for the industry came from Subaru. The initial offering of the BRZ model purely on-line has clearly taken sales away from their dealer network, but I suspect that the dealers will pick up the delivery, warranty and after-sales. I wonder how happy Subaru dealers are to lose out on those sales? And I wonder what would happen if an Australian bike or scooter supplier decided to take a similar approach with one of its models? Whatever the outcome, the retail model is again adapting to technology, and those in business have to move with the times, but to me it is clear that suppliers and dealers will have to become even more closely integrated to survive in the information age, and that failure to properly consider the big picture could have interesting consequences in the medium to long term. The Bellavita is still on the way. Pricing and the initial colour range now confirmed. 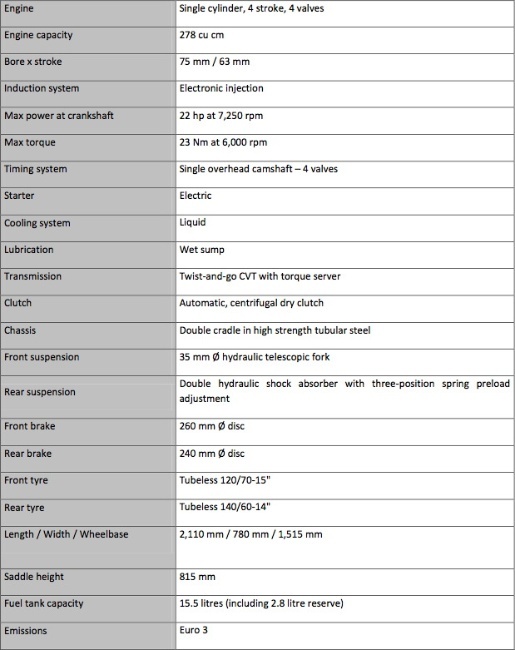 Specification chart included. The TGB Bellavita is now getting closer to arriving in Australia. The first week of September is when the first shipment is due to arrive. 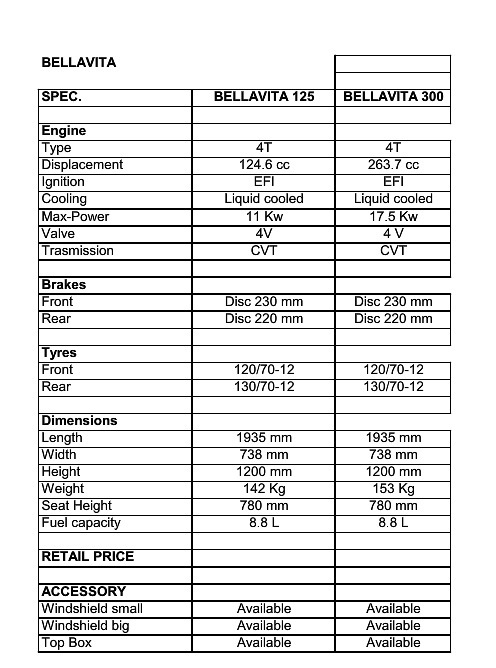 The Bellavita 300 will be first to arrive, followed by the 125 cc version two months after. Pricing has been set for both capacities. The 300 class Bellavita will be $5490 plus on roads. The 125 class version will be $4290 plus on roads. Both these scooters will be at the upcoming Sydney Scooter Expo. If you'd like to be one of the first to ride this model keep an eye out for online registration to be opened up shortly. John Sample Automotive, Australian importers of Aprilia & Moto Guzzi motorcycles and scooters have announced a strong first half year result for both brands. Motorcycle sales in Australia increased in the first half of 2012, according to figures releases today by the Federal Chamber of Automotive Industries (FCAI). In the six months to the end of June, 51,952 motorcycles were delivered to Australian customers, representing an increase of 1,331 units (or 2.6 per cent) over the same period in 2011. Sales growth was mostly driven by the road bike segment, which increased 8.4 per cent (1,567 units) to 20,174 and the All-terrain Vehicle (ATV) segment, which increased by 3.4 per cent (357 units) to 10,951 compared with the first six months of 2011. Scooter sales saw a big drop to 5,233 units, being 13.6 per cent or 832 less scooters sold year to date compared with last year. The off-road segment accounted for 15,594 sales (to the end of June) for a 30 per cent market share. The road bike segment remains the single largest by market share, with half-year sales representing 39% of all motorcycles sold. ATV deliveries represented 21 per cent of the market, while scooters’ share decreased to 10 per cent. Honda was the number one brand, delivering 11,788 motorcycles to the end of June. Yamaha was in second position to the end of June with 8,692 sales, followed by Suzuki (6,105), Kawasaki (4,612) and Harley-Davidson (3,643). During the month of June, CFMoto again recorded superb retail results and continued their expansion within the Australian motorcycle market. According to results just released by ERG International, the CFMoto brand consisting of motorcycles, scooters and ATVs is celebrating a 92.1% increase in sales for the first half of 2012 against the same period last year. “Impressively, CFMoto is now the 11th largest motorcycle brand in the country, just three solitary units behind 9th position,” said National Sales Manager, Alan Collins. “With the recent launch of the 650NK sports bike and V‐Night 150cc commuter during June, and the upcoming release of the Rancher 800 UTV and Z8 sports side x side, we have some excellent incremental growth opportunities. In addition to the growth CFMoto is recording in the market place, the range is also continuing grow. New ATV models, namely the CFMoto X8 and Rancher 600i have been released to the Australian market over recent months, and in the month of June CFMoto excitingly expanded their motorcycle range adding two new models – the 650NK sports bike and V‐Night 150cc commuter. 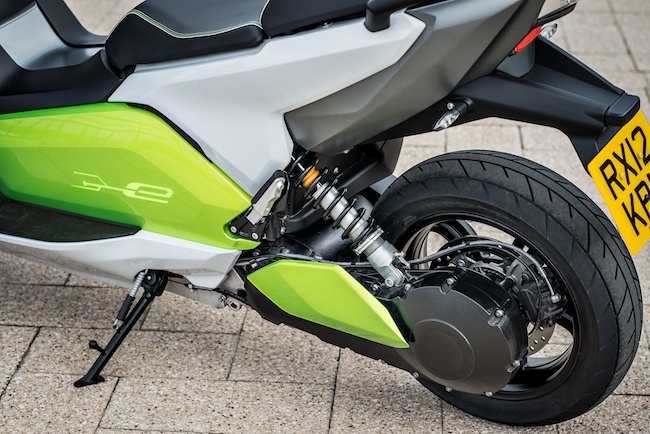 In the motorcycle sector, year to date CFMoto retails have already increased 50% in comparison to this time last year, and that is without the benefit of the two new models of which sales will commence to be reported to the industry in July. To assist in continuing the retail momentum, customers who purchase a CFMoto motorcycle or scooter in the month of July will receive a FREE CFMoto Rider Jacket (valued at $299). In addition to the growing CFMoto motorcycle range, CFMoto ATVs continue to be the fastest growing ATV brand in Australia! According to ERG results, CFMoto ATVs owned 5.3% of the national market during June, just shy of their first half 2012 share of 5.7%. “One of the unique points about CFMoto is that they are an export oriented manufacturer focused on Western markets, and as such are willing and able to tailor a product to suit our uniquely harsh conditions.”For the month of July, CFMoto is offering a FREE CFMoto Start Up Kit valued at $599 with CFMoto ATV purchases. The kit includes practical parts and accessories that will make your CFMoto ATV experience even better! In Australia, CFMoto is distributed by Mojo Motorcycles, who were established eight years ago and are the exclusive distributor for TGB scooters, Daelim motorcycles and scooters, as well as CFMoto motorcycles, scooters and ATVs. In 2012 Mojo Motorcycles currently hold 3.2% of the total Australian motorcycle market. Daelim motorcycles and scooters were relaunched in to the market by Australian owned company Mojo Motorcycles in early 2011. Since this relaunch, Daelim has continued to record month on month growth, according to results released by motorcycle industry speciality, ERG International. “As the Daelim brand is continuing to mature in the Australian market place, customers are beginning to understand the heritage behind the name and understand the enormity of Daelim’s global network,” says Daelim National Sales Manager, Alan Collins. According to the latest ERG results, the Daelim brand has grown 240.6% year to date, in comparison to the year previously. 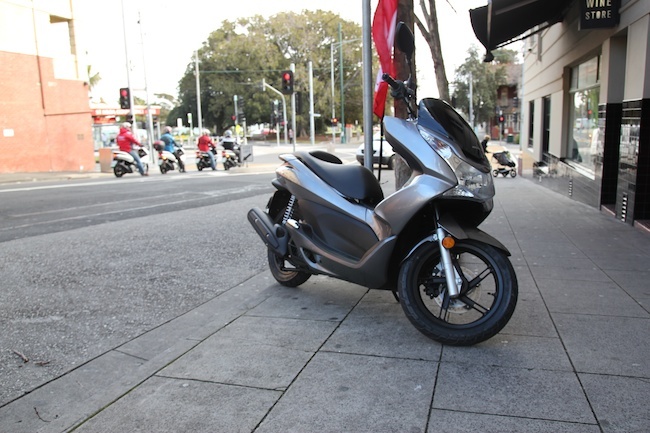 Daelim offers a range of scooters from a 50cc to 125cc that offer comfortable, reliable commuting to Australian customers. 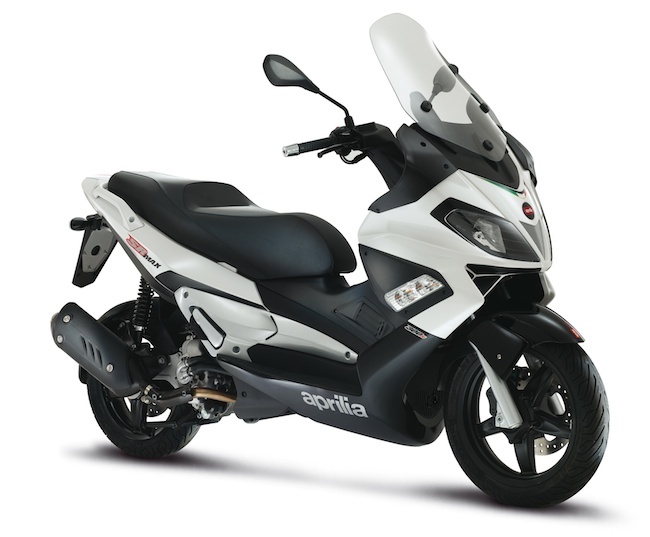 In addition Daelim also has a 250cc motorcycle, the VJF 250 on the market. A standout in the Daelim range is the unique designed Daelim B‐Bone. The B‐Bone features a powerful 125cc oil cooled engine, front and rear disc brakes and 12" alloy wheels, and a revolutionary naked design. Year to date, Daelim scooters have recorded fantastic growth within the Australian market place with sales increasing by 628.1% in comparison to the same time last year. With a range of stylish and sporty commuters, the Daelim scooter range year to date hold 4.5% of the entire Australian scooter market. Founded in 1978, the Daelim Factory in Korea uses its wealth of experience to continually develop and build the product range. Manufacturing over 300,000 vehicles a year, Daelim is set for growth both in Australia and abroad by building a strong scooter and motorcycle range supported by the most advanced technology and a growing global network. In Australia, Daelim is distributed by Mojo Motorcycles, who were established eight years ago and are the exclusive distributor for CFMoto motorcycles, scooters and ATVs, Daelim motorcycles and scooters, as well as TGB scooters. In 2012 Mojo Motorcycles are currently holding 3.2% of the total Australian motorcycle market, according to results just released by ERG International. Mojo Motorcycles pride themselves on importing quality products to the Australian market. With each of the Mojo Motorcycles brands kicking goals monthly, there is no doubt that Mojo Motorcycles is well on the way to becoming a market leader. For further information on the Daelim range please visit www.daelim.com.au. If you LOVE Daelim, you should LIKE the newly launched Daelim Facebook page. Daelim Facebook keeps members up to date on all things Daelim!!! June saw TGB Scooters post yet another solid result, boosting its share of the market for the first half of the year to 8.6%, a growth result in a market which has contracted by 13.6%. As a world renowned scooter brand, TGB offers customers high quality products at excellent price points. 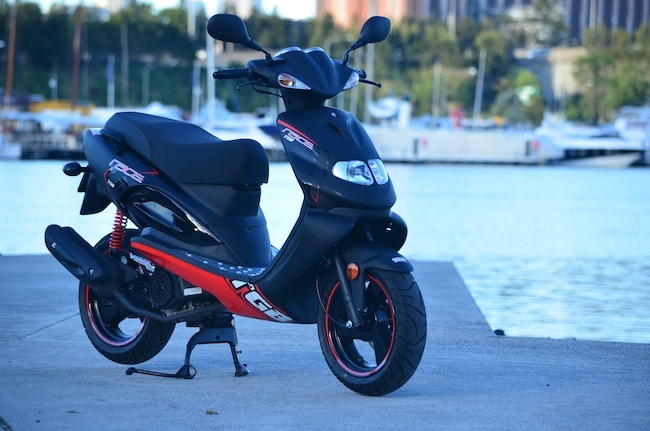 The brand TGB is no stranger to the Australian market, with over 8,000 scooters having been sold over the past 10 years. 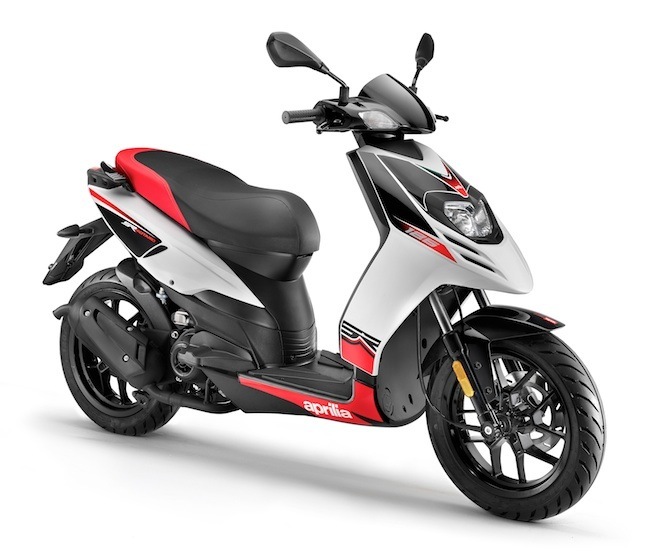 The expansion of the 50cc range this year has assisted TGB to continually increase its market penetration, with the launch of the Bullet 50 and Bullet RS 50 to complement the existing 101S and Tapo 50 models giving TGB the strongest low‐capacity range on the market. “TGB are world‐renowned for their quality and remain one of the very few manufacturers who have resisted the trend to manufacture off‐shore. All TGB products are manufactured at the TGB factory in Taiwan,” said National Sales Manager, Alan Collins. To continue the momentum with 50cc scooters, this month TGB is offering a fantastic special on the popular TGB 101S. A free jacket, helmet and top box will be given away FREE to every Australian customer that purchases a 101s in July and August, 2012. Manufactured in Taiwan, TGB scooters are built to the highest world renowned standards with customers supported by a 2 Year Factory Warranty upon purchase and the after sales support from national distributor Mojo Motorcycles. Away from the 50cc scooters, other TGB scooters range up to a 300cc model. ATVs, Daelim motorcycles and scooters, as well as TGB scooters. In 2012 Mojo Motorcycles currently hold 3.2% of the total Australian motorcycle market, according to results just released by ERG International. Mojo Motorcycles pride themselves on importing quality products to the Australian market. If you LOVE TGB Scooters, you should LIKE the newly launched TGB Scooters Facebook page. TGB Scooters Facebook keeps members up to date on all things TGB!!! Honda’s positive trends that commenced in January have continued through the entire first half of 2012 culminating in recording an inspiring 13% year on year growth according to the 2012 FCAI National Sales Report*. As the year clocks into its second half, Honda Motorcycles continue to lead the motorcycle market by recording growth across almost all product categories, retaining number one market share and dominating the entry level market with the popular CBR250R. Remaining untouchable at the top of the motorcycle sales ladder, the CBR250R is supported by other Honda models including newcomer CB125e and old favourites, CRF230F, CT110 and CRF50F allowing Honda to boast five models out of the top ten. Overall, Honda recorded substantial growth in three of the four product categories with a 30.2% increase in Road, 25% increase in Scooter, 9.4% increase in ATV and no increase but a steady result recorded in Off-Road. Honda topped many categories including Super Sport, ATV, Trail, Fun, Naked and Entry with many models remaining consistent performers. One such model is Honda’s TRX250TM which remains at the top of the ATV market and recorded more than double the volume compared to the competitors. The CBR1000RR which is celebrating 20 years in 2012 also remains steady at the top of the Super Sport category. 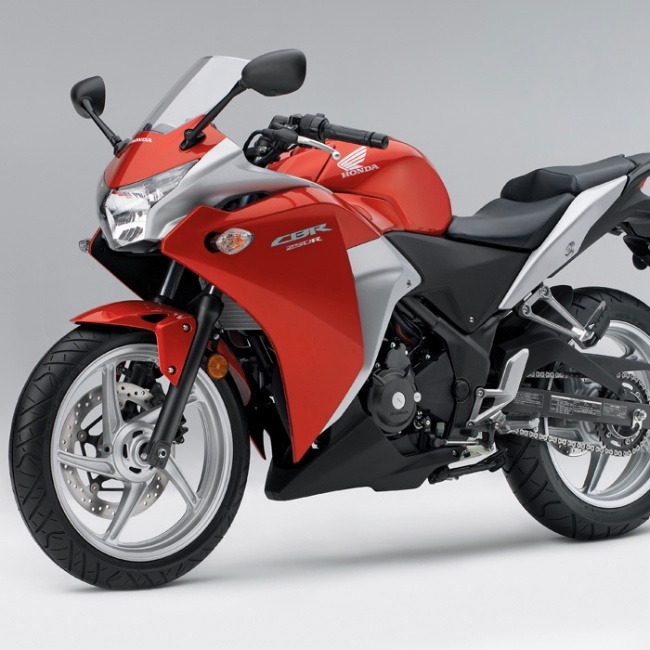 Looking into the second half of 2012, Honda has more exciting new releases on the way. Anticipation is high for the all-new, dual purpose CRF250L which is due for release next month and will offer riders a similar engine package to the CBR250R and a newly designed frame. Honda also has some very exciting models on the way that are yet to be announced. The Sydney Scooter Expo is returning for its 2nd year. Come and experience the scooter lifestyle. If you take a look across our fine city of Sydney, around Australia even, you'll notice the growing trend of people looking for inexpensive, convenient transportation options. People are turning to scooters and it's not hard to see why. The humble scooter is cheap to run, easy to ride, fashionable and convenient. Though, did you know riding a scooter can also be a whole lot of fun? The Sydney Scooter Expo lets you experience the scooter lifestyle first hand. A life changing form of transport that can be as much about saving time and money, as it is about feeling a sense of freedom. Scooters come in so many shapes and sizes, styles and colours, they're as individual as you. The Sydney Scooter Expo becomes your connection to the scooter lifestyle. 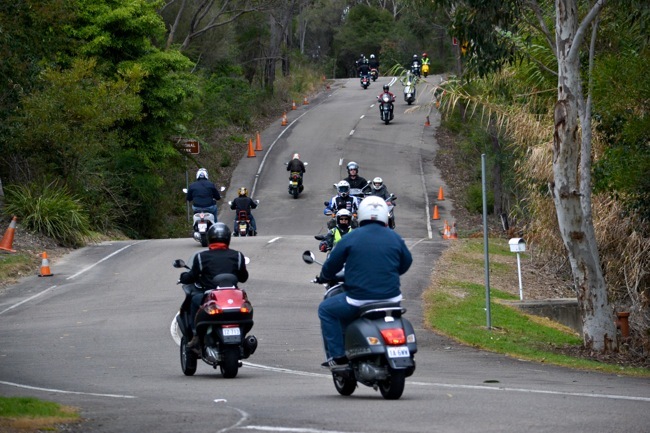 If 2011 was anything to go by, this year we'll see the largest gathering of scooters ever seen in Australia. The 2012 Sydney Scooter Expo will feature all the leading scooter manufacturers. Brands like Vespa, Piaggio and Honda will be there. Other leading manufacturers like Yamaha, TGB, SYM and Aprilia will also be present. The 2012 Sydney Scooter Expo is being held at the Honda Australia Roadcraft Training facility (HART), St Ives. 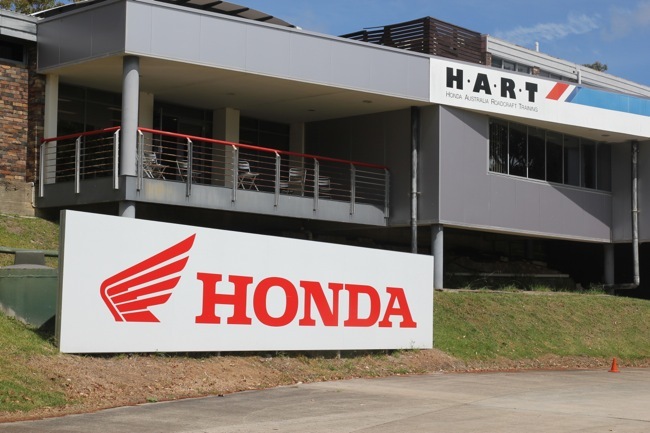 Just north of Sydney's CBD, HART offers a unique location featuring its very own onsite test ride facility. Not only will you see every scooter imaginable on display, you'll also be able to test ride your very own shortlist of favourites. * All in a safe, relaxed, supervised environment. Bring the whole family and experience the scooter lifestyle, talk to the experts, have a bite to eat. Touch and feel the hundreds of scooters on display. 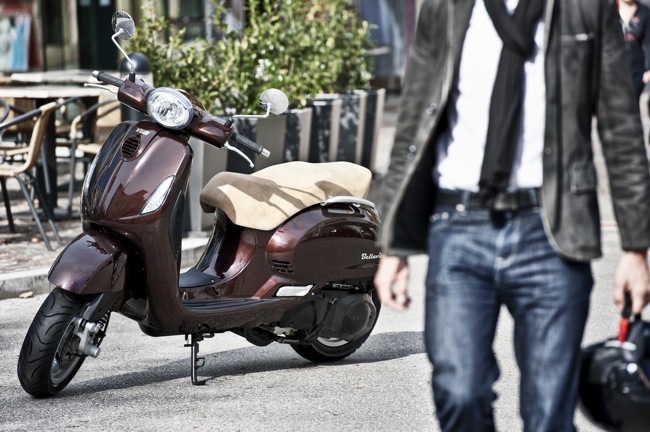 Find out how to get a scooter licence, browse the latest in accessories. Learn how a scooter can change your life forever. 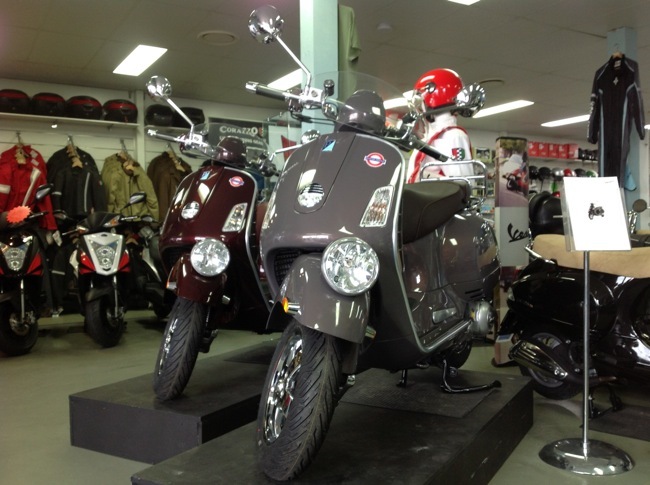 For further updates visit www.scootersales.com.au. 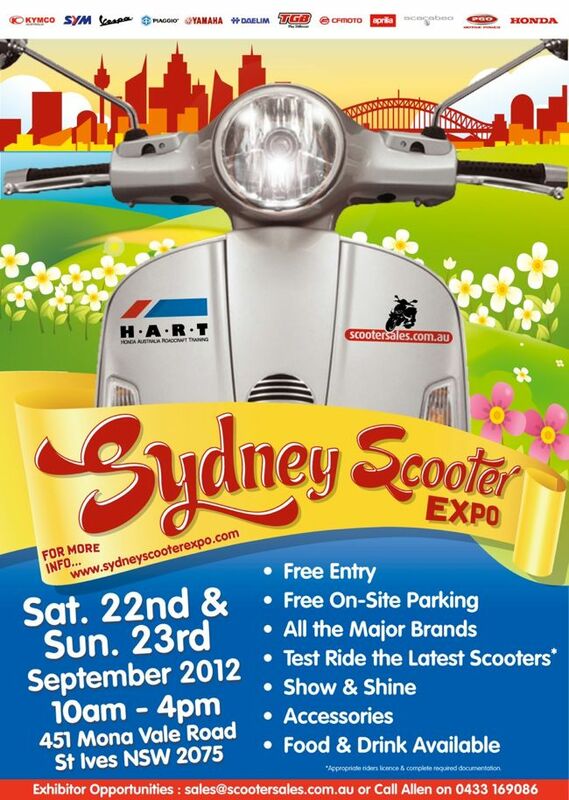 See you at the 2012 Sydney Scooter Expo. *As long as you have the appropriate riders licence and have filled out the required documentation. 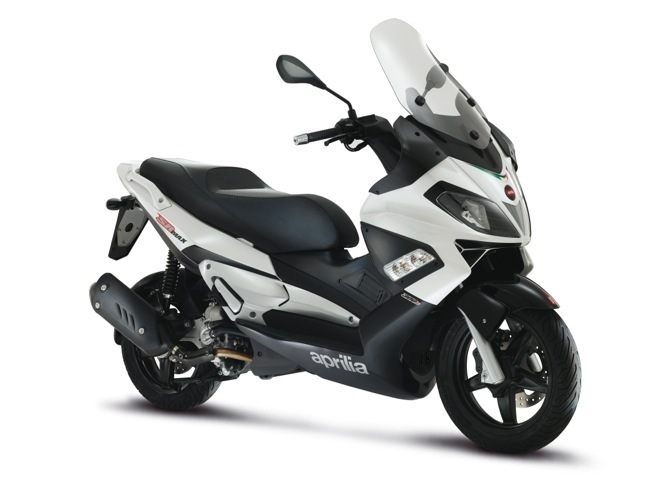 The SR MAX 300 was inspired by the racing world and is a scooter which guarantees top performance and great versatility whether on daily commutes or longer weekend outings. The compact but light nose holds the aesthetic dynamics of the headlight assembly: A silver coloured grille is inserted between the two lights, a simple, thin screen which gives the SR MAX 300 an energetic expression. 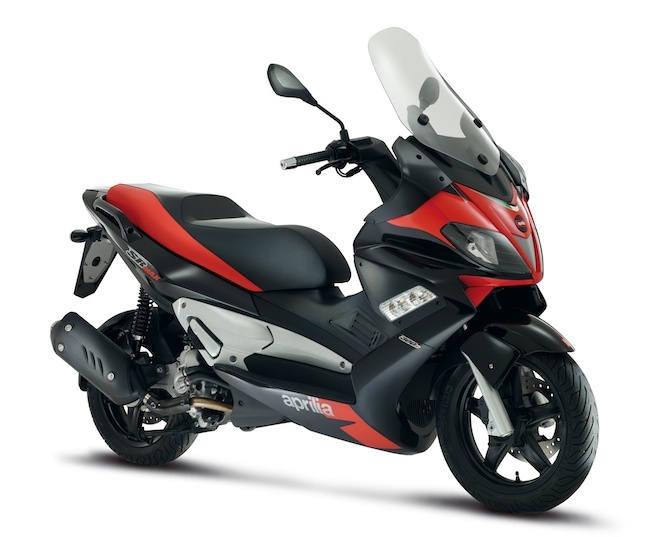 The graphics which encompass the headlight and the air intakes create a "contrast" with the Scooter colouring, together with the "three-coloured" scheme which rounds off the SR MAX’s unmistakable style. Suitable for every day travel, but also designed to provide an exciting ride for longer trips, Aprilia SR MAX promises to deliver in any condition and every situation. Featuring a single-cylinder 4 valve liquid cooled, electronic injected engine; characterised by a 75 mm bore and 63 mm stroke, The SR MAX reaches maximum torque of 23 Nm at 6000 @ rpm. The result is excellent torque distribution and consequently fast acceleration for when it’s needed. The 2012 Aprilia SR MAX is available in the colours Factory Red, a scheme derived from the mighty award winning RSV4 Factory along with Factory White. 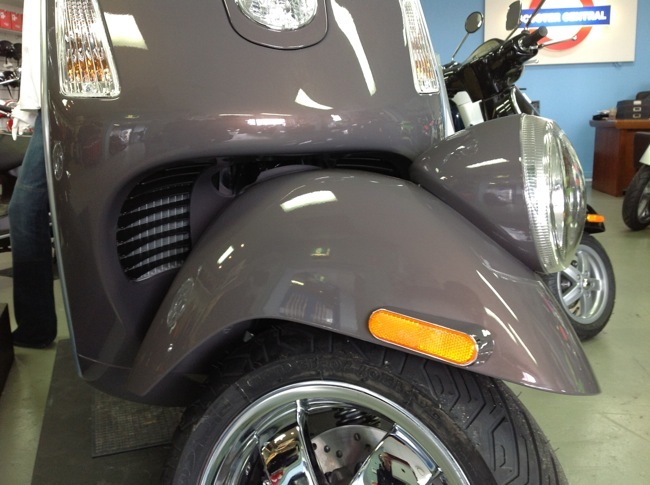 The RRP for this particular scooter will be $6,990 with first shipments expected to arrive in late July. Honda is offering Free On Roads* on ST1300, CB1100, VTR250 motorcycles and SH150i or SH300i scooters between now and September 30, 2012, letting you save big on your next two wheeled machine. Delivering an exceptional combination of exhilarating performance and luxurious comfort, Honda's ST1300 is widely considered to be the premiere sports touring machine. This touring power house contains a high powered 1,266cc, fuel injected V4 engine along with Honda's latest programmed fuel injection (PGM-FI) and electronic digital ignition. The CB1100 offers a simply sublime two-wheeled experience thanks to its smooth power delivered from an 1140cc inline four-cylinder engine. Despite its unique vintage look the CB1100 offers all the mod cons of a new bike. 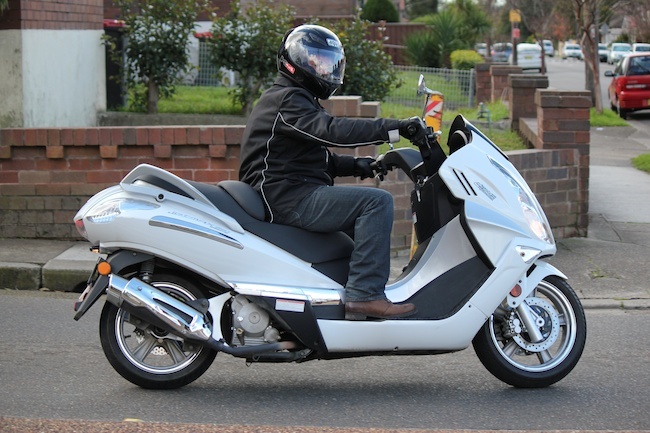 Ideal for first time riders, the VTR250 is a learner approved, compact power pack. Thanks to its lightweight chassis and easy handling characteristics the VTR250 also attracts riders of all levels. Powered by a reliable, liquid cooled, 4-stroke V-twin engine, the VTR250 also boasts fuel injection. Honda's scooter duo the SH150i and SH300i combine cutting edge design with thrilling ride qualities. Lightweight and with slim proportions these two wheeled commuter machines are powered by fuel-injected, liquid-cooled, 4-stroke engines which delivers strong, smooth power and ultra-low exhaust emissions. Offer available until September 30, 2012. See your Honda Dealer and save big with Free On Roads*. 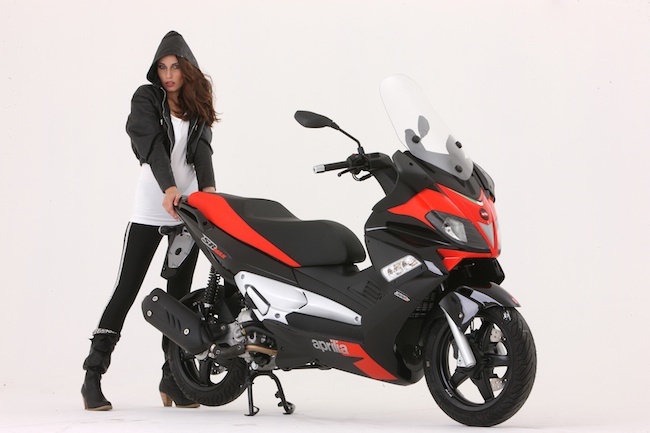 While already offering compact proportions, economical advantages, fashionable good looks and an incredibly low price tag, Honda’s popular PCX125 scooter just got more attractive with $300 HondaDollars* between now and September 30, 2012. 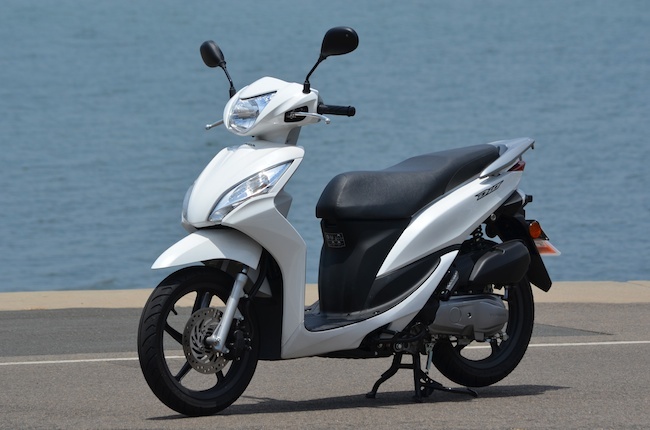 Created for commuters looking for a fuel efficient, fun ride around town, the learner approved PCX125 scooter boasts Honda’s famous quality and durability. At the heart of the machine is a lightweight, liquid cooled engine featuring a Honda PGM-FI fuel injection system that ensures seamless, effortless power delivery via the smooth V-belt transmission, while also reducing emissions and fuel consumption. The innovative Idle Stop function ensures maximum fuel efficiency by allowing the engine to automatically stop running after 3 seconds of idling, the engine then re-starts when the throttle grip is twisted. Idle Stop mode is enabled or disabled via a convenient switch on the right handlebar. 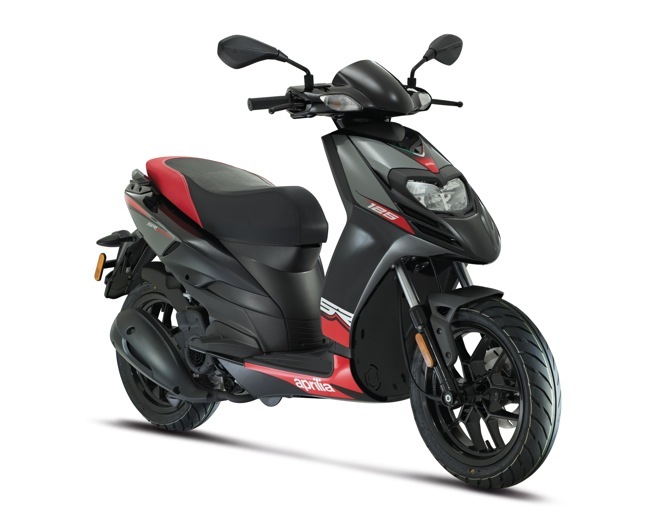 In every aspect, from its low-noise, low-emissions operation to its easy handling and contemporary image, the PCX125 is designed as a practical, fun ride. HondaDollars can be used in the dealership at the time of purchase towards the purchase price, for accessories or servicing. For more information visit www.hondamotorcycles.com.au or 1 300 1 HONDA for your local Honda Dealer. Offer available until September 30, 2012.